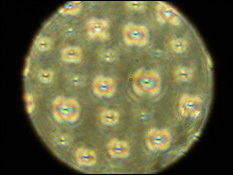 A polarizing microscope picture showing the nematic-like defects formed in a smectic liquid crystal at room temperature. Department of Materials Science and Engineering and Maryland NanoCenter associate professor Luz J. Martínez-Miranda has been awarded a 3-year, $360,000 National Science Foundation grant, funded by the American Recovery and Reinvestment Act, for a proposal titled "Effect of the Nanoparticle Surface Termination on the Nanoparticle-Smectic Liquid Crystal Interaction: Order/Disorder Effect." 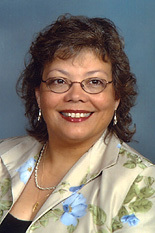 The research will be carried out in collaboration with Dr. Lynn Kurihara, a chemist at the Naval Research Laboratory. While most people associate liquid crystals with televisions and other device displays, liquid crystal structures are found throughout nature, including the cell walls of the human body. Their ability to change phase (the alignment of their molecules) allows cells to perform certain tasks, including the absorption or excretion of nutrients and drugs. Martínez-Miranda has spent the past ten years examining liquid crystal behavior in cell walls for bio-applications including human healthcare. In her current study, she and Kurihara are using the liquid crystals as a model for cell walls. By understanding the effect of certain kinds of nanoparticles on liquid crystals, they hope to build a general interaction model that could be used by other researchers to test how effectively a drug could be delivered to and taken up (ingested) by different kinds of cells. "Doing these kinds of studies with cultured cells requires a complex facility that many researchers simply can't obtain," Martínez-Miranda explains. "If we can produce an accurate model, it could serve as a platform for preliminary drug testing, and speed up the process." In drug delivery, organic molecules called terminal compounds are attached to inorganic nanoparticles. 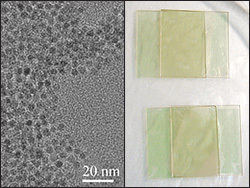 They create a coating, a disguise designed to tempt the targeted cell types to absorb the nanoparticles instead of regarding them as foreign objects. They also help identify the target inside the body. Martínez-Miranda is interested in how the terminal compounds order or disorder cell walls as they pass through. 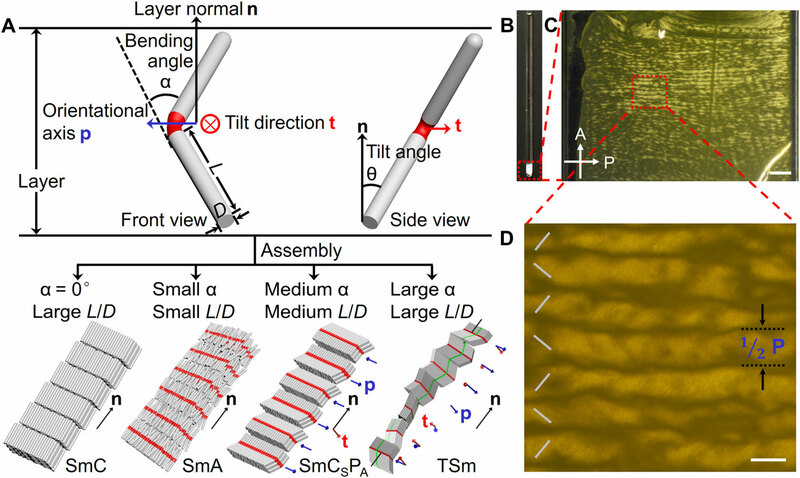 The liquid crystals in a cell wall can have a nematic structure (semi-ordered and not aligned) or a smectic structure (ordered and aligned). Smectic structures, which are more common in organic materials, are more difficult to "open up" to allow drugs to enter the cell. Creating terminal compounds that disorder the smectic structure, however, is not necessarily the solution. "Ordering and disordering are neither good nor bad things," Martínez-Miranda explains. "Which state is more desirable depends on what you're trying to accomplish. If you're attacking cancerous cells, disordering—which could mean rupturing—their walls may be the outcome you need. The real challenge is to have the terminal compounds change the phase of the liquid crystal to whatever configuration makes it easiest for the drug to get inside the cell. What I've observed is that we can achieve different liquid crystal configurations by varying the molecular structure of the terminal compound it interacts with. This may apply to the cell wall." While many researchers are studying the interactions between cells and nanoparticles, Martínez-Miranda says that what sets her research apart is its particular focus on the effects different terminal compounds have on smectic ordering. She was one of the first people to publish research in that area. "When I started my liquid crystal research ten years ago," she explains, "people were concentrating mostly on liquid crystal structures with nematic ordering. The focus was on engineering-oriented applications, rather than biological ones, so the terminal compounds that were studied were chosen for their potential in engineering applications. What was learned from that research did not necessarily apply to biological applications." "I'm really excited about the project," Martínez-Miranda adds. "Anything we learn from it is important because it is new territory."